Torsion is a monophonic Audio Unit instrument plugin built upon a unique combination of multiple synthesis technologies and modulation sources, wrapped into an intuitive interface which makes working with it as fun as playing a game. It has a very distinctive, original sound character – and is ready to push your musical creativity in a fresh new direction. Reinvented classics. At first glance, Torsion's sound structure is similar to a traditional subtractive synthesiser – three oscillators going into a low-pass filter and into an amplifier – and it's certainly as easy to use. But Torsion's oscillators are completely different: they produce simple additive waves based on just a few partials, which are then enriched with lots of new spectral content using a wave transformer, which literally "curls" the wave in real time. To further spice the sound up, it offers a vast array of effects – including frequency shifter, filter FM, delay, and more. Modulation galore. Torsion features as many as four separate LFO generators - one for each oscillator and one for the filter and output amplifier. In addition to precise synchronisation, each LFO cycle can be self-randomised, which makes the modulation rhythmical yet non-repetitive. There are also two AHDSR envelope generators, as well as a two-dimensional chaos oscillator. Interactive experience. The interface of Torsion is designed with high-contrast, colour coded elements, which lets you operate the instrument intuitively in just a few minutes. It also includes graphic representations for every building block – oscillator and LFO waveforms, envelope shapes and filter spectrum all change as you modify them, making sound design with Torsion a truly engaging, fun process. 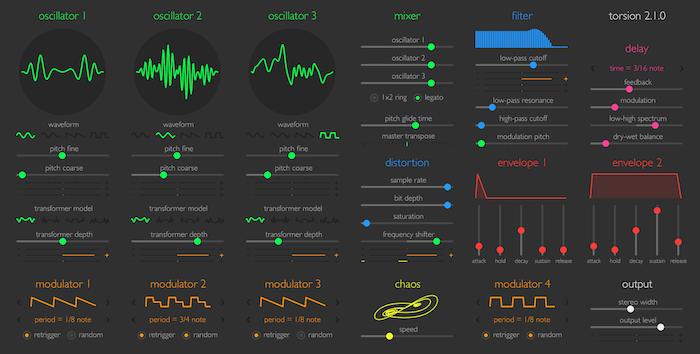 Three oscillators each with four additive waveforms and four wave transform models. -24 dB/octave resonant low-pass filter with FM oscillator. Ring modulator, sample rate and bit depth reduction, saturation, frequency shifter, modulation delay. Four LFO generators each with 8 waveforms and per-cycle randomisation. Factory patch bank includes 170 presets. – Enhanced user interface with darker background, thinner fonts and removed shadows. – New design for oscillator waveform and transformer model selectors. – Support for sandboxed hosts. – 10 new preset patches. Torsion works with Logic, GarageBand, Live, Maschine, MainStage, ReNoise, Reaper, Studio One, Digital Performer, Tracktion and other software that supports Audio Unit instrument plugins. It comes in 32/64 bit format for Intel Macs running OS X 10.6 or later, and supports Retina screen resolution.